A representative example of Littlestone Ammunition's loading of the Hornady 158-grain semi wadcutter bullet. Want better, more dependable knock-down power? 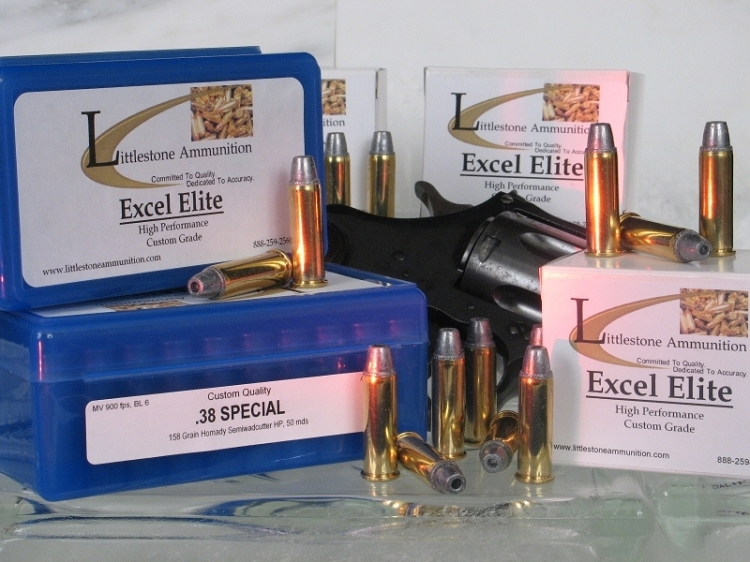 Then load up your .38 Special with the legendary Custom Quality Excel Elite. This ammo is made using precise manufacturing processes and the highest quality components to provide consistent, dependable performance. Lubricated lead bullets feature excellent accuracy and sure functioning. These lubricated Hornady bullets are made to precise manufacturing tolerances for superb accuracy. An outstanding ammunition value at these prices. Feature 3: MV / Energy / Barrel: 900 fps / 284 ft lbs / 6"